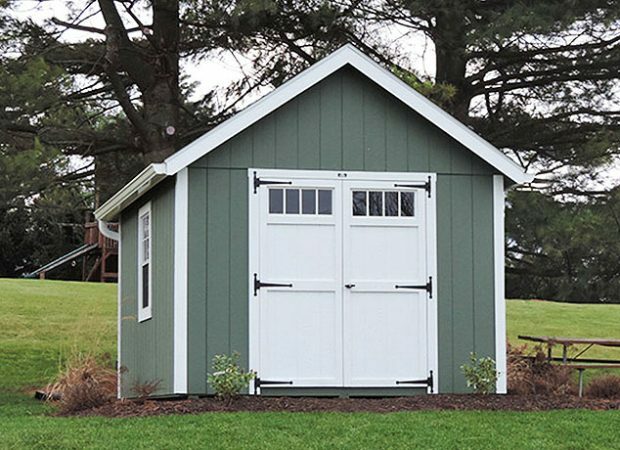 If you invested in a heavy-duty riding mower, lawn tractor, or zero-turn mower this spring, then you need an equally heavy-duty lawn mower shed to match. Your lawn mower is a serious piece of equipment in every sense of the word, so take care of it like one. Think about it: your mower was a big investment and you’re planning on getting more than a decade of rock-solid performance from it. Storing it properly is a crucial component to enjoying the longevity you expect. Plus, consider the size and weight — those numbers alone make it clear that this is no run-of-the-mill push mower. The dimensions of your mower can be too big for smaller sheds and certain styles. Plus, the weight from your riding mower (often in excess of 1,000 lbs) can break or damage flimsier sheds. Glick Woodworks is Pennsylvania’s expert shed craftsmen. We know all about matching heavy-duty lawn equipment to the riding mower sheds they need. As soon as you fire up the engine of your lawn mower, you know this is real power equipment. When you take that first loop of your lawn, you decide this is the only way to cut grass. When you see this mower side-by-side with your old one, the difference is clear. 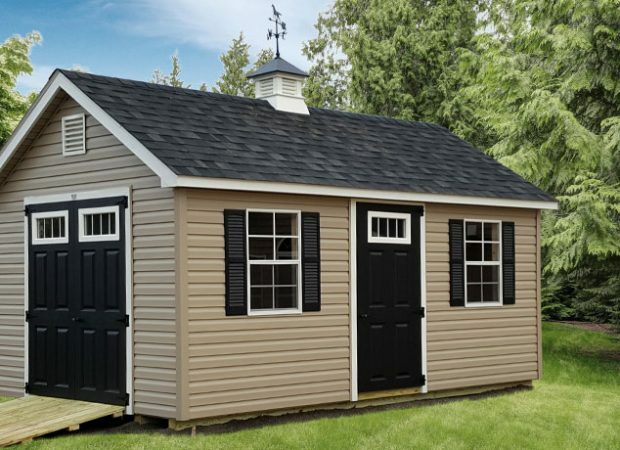 You need a shed to match — and this is what to look for. In most cases, the shed style and design is more about looking good and matching your home. When finding a shed for your riding mower, you need one with the depth to store a long piece of equipment. Some styles of sheds can be too shallow to accompany the size of your mower. Your riding mower is closer to a car than a small push mower. It’s not uncommon for zero-turn mowers and riding tractors to be 7 feet long and 5 feet wide — you’ll need a decent size storage space to handle that. The right size shed for the job is a 10 foot by 16 foot option. With those dimensions, you have enough room to comfortably house a large mower and extra attachments without wasting too much space. When your mower weighs over 500 pounds, you’re going to drive it everywhere it goes. If you want to get it into and out of your shed, that shed is going to need a durable ramp that’s up to the job. While some shed builders cut corners with the ramps, we don’t. Built with pressure-treated lumber, our heavy-duty ramps are 4 feet long and come in four standard size’s: 4 foot, 5 foot, 6 foot, and 9 foot. We can also custom build any ramp to fit the shed. Our ramps have proven they’re up to the challenge of handling lawn tractors for years to come. Your new heavy-duty lawnmower is quite literally heavy enough to break the floor on lesser sheds. That’s why when looking for a riding mower shed, you need to find a shed with a reinforced floor. We can upgrade the 2X4’s to 12 inches apart rather than 16. This makes the floor able to withstand far greater weight. We can upgrade to double 5/8 inch flooring for a total of inch-and-a-quarter floorboards for your shed floor. This again makes the floor much stronger. Finally, since driving mowers in and out of sheds can chip or damage even the sturdiest shed floors, we offer the option of diamond plate door tread. This aluminum plate keeps the plywood edge at the door from chipping when driving over it with your lawn mower. Since your riding mower uses a serious gasoline engine to generate all that power, vents in your shed can be a good extra amenity to include. Available in the ridge or gables, these vents allow any lawnmower fumes to safely ventilate. This upgrade can also be important if you plan to do maintenance in your mower shed. While your new riding mower shed was bought to house your beloved new piece of lawn equipment, chances are you have plenty of other stuff to store, too. Choosing a shed with space to not only accommodate your mower but other equipment as well is a great idea. 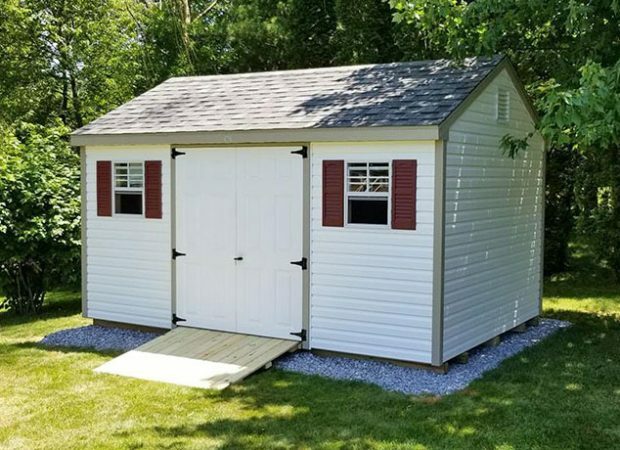 Our sheds come customizable with off-ground shelving that’s perfect for storing other lawn equipment. Glick Woodworks is a premier Amish shed builder that serves Pennsylvania, Maryland, and New Jersey. We deliver and install a wide variety of sheds to solve storage problems for homeowners throughout our service areas. We build the custom lawn mower storage sheds that homeowners use to keep their heavy equipment safe and protected from the elements. If you have questions or would like to order your shed, contact us to start a conversation. "We absolutely love our new shed; great craftsmanship done. Shed is sound and perfect for our needs."